In case you really wanted to leave your copy of Legally Blonde to your distant descendants: WA-based start-up Cranberry LLC claims that its stone DVDs will last a good 1,000 years into the future. On average, consumer-grade CDs and DVDs - that is, the discs sold to consumers to burn via their computer - last anywhere from two to five years before beginning to degrade (at least, if the government is to be believed), and with more and more people turning to digital media to store precious memories like family photos, it makes sense to want to preserve your data in a format that will last. 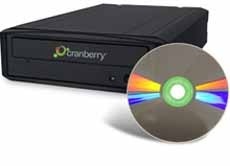 Some companies have developed long-lasting DVDs with a reported shelf-life of 300 years, but Ferndale, WA-based Cranberry LLC thinks it can one-up them: The company has claimed that its proprietary DiamonDisc technology will still be good a thousand years from now. In fact, says the Cranberry website, the DiamonDisc will literally etch your memories in stone - synthetic "diamond-like" stone, that is. Unlike normal discs, the DiamonDisc contains no silver or gold reflective layer, rendering it transparent ... but also rendering it without any laser-sensitive ink to decay. While the only way to determine whether or not the product will actually last 1,000 years will be up to our great-great-great-great-etc-grandchildren, Cranberry claims that the DiamonDisc is unharmed by "heat as high as 176 degrees Fahrenheit, ultraviolet rays or normal material deterioration." So you could leave it outside in Death Valley and it'd still be hunky-dory at the end of the day. There are downsides to the technology, of course: While any normal DVD player can read one of the discs, they can only be burned by Cranberry itself, which means trusting your private data to a third party. Also, a single DiamonDisc holds a meager 4.7GB of information, which is standard DVD size - and while perfectly suitable for holding things like family photos, it seems awfully small in the era of High-Definition video and Blu-Ray. But this of course is ignoring the elephant in the room: Will we even have DVD players a millennium from now? It's only been twenty-some-odd years since 8-track tapes went the way of the dodo, and I challenge anyone to find a working player for that. You might be able to preserve your data for the future to find, but it means nothing if they don't have the technology to access it, right? So let's file this one under "technology that's cool, but seems kind of impractical."